Urban and Regional Planning Series, Volume 6: Sub-Regional Planning Studies: An Evaluation reviews the sub-regional planning in the East Midlands Region of England. 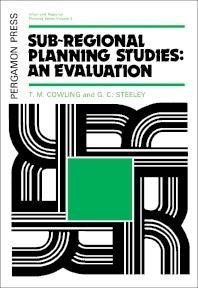 This book discusses the sub-regional planning in Britain; impact of new techniques on the analysis stage; advisory role of sub-regional planning; and linking local and regional/national planning. The distinguishing levels of planning in practice; criteria for establishing a data bank; demonstrating the strategy; and traditional role of analysis are also elaborated. This publication also covers the long-range forecasting; objectives in an integrated plan-making process; land-use/transportation surveys; and procedure for evaluating sub-regional studies. This volume is a good reference for researchers and specialists concerned with planning and government in the East Midlands.